Update: The seats have been filled and registrations have closed. Thanks. This time, I am conducting this course in collaboration with STeP-IN Forum and the target audience is testers with experience between 0 - 3 years. We will start with understanding the basic terms like bug - issue - quality - defect. We will definitely NOT go through V-Model, Waterfall and many other such terms which is slowly losing out its importance in today's testing world. This session will focus on how to generate test ideas, learn from different sources to test any product. 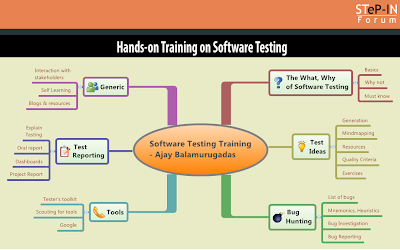 We will also know that software testing is not only about testing Functionality. There is no fun without bugs. So, how do we find them? How is bug investigation different from bug hunting? How to find Sev 1 bugs? We will definitely be using many tools in our sessions. We will also focus on how to scout for resources and tools in particular. Once a tester completes the test execution, (s)he should be able to provide a professional test report. We will create different reports and get feedback from the group. Does your learning stop after a course or workshop? How can one learn about software testing every day? We will go through few important areas for self-learning. Nice Job Ajay, Best of luck, Have a great Day. Hi Ajay I am studying to qualify foundation course of testing of BCS but just reading the book is very boring that's why I want to be part of training or classes.Please can you tell me when would be your next training for beginners. 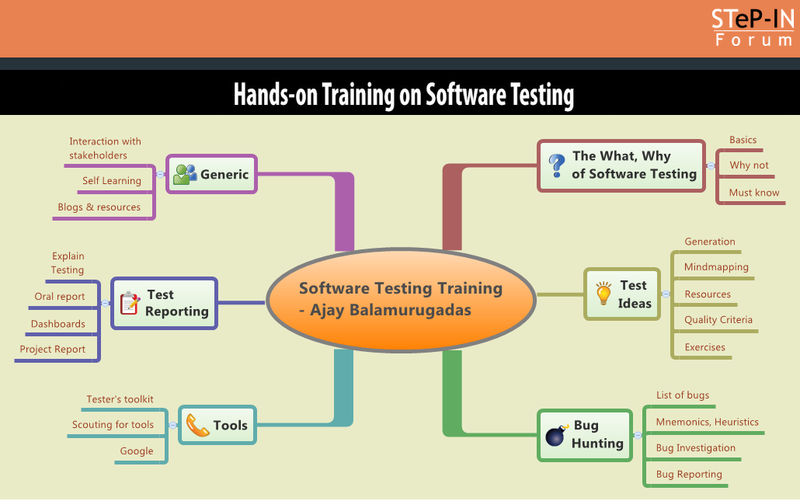 It is great that training such as this are being done to enhance one's knowledge in software testing. Thank you for sharing. Hello Sir, is there a new training session in coming days?